As the blue-circular insert shows, several of the sunspot’s dark cores are larger than Earth itself. From end to end, the sunspot group sprawls more than 100,000 km. These dimensions make it an easy target for backyard solar telescopes. If you have one, take a look. You might catch some action. NOAA forecasters estimate a 55% chance of M-class flares and a 10% chance of X-flares on May 7th. 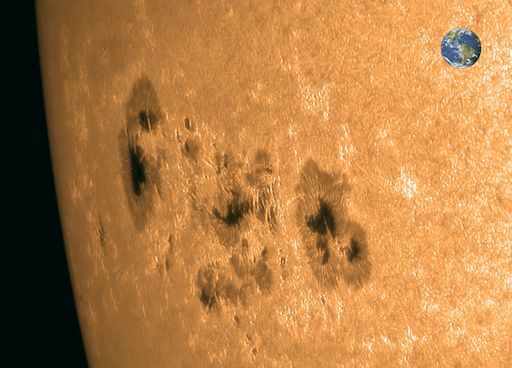 This entry was posted in Of Interest and tagged solar activity, Solar Flares, sunspots by marcia. Bookmark the permalink.